When I go out to do my little freelance stories on weekends, I enjoy getting to get out of my cubicle and talk to people, but I have to admit that, even more than that, I enjoy meeting new dogs. 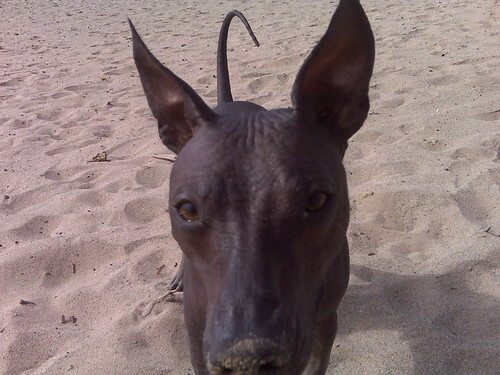 Today, I met a Mexican hairless dog, Diego, and his owner. She told me she got a hairless dog because her previous dog was an Afghan hound and that she got so tired of combing and combing its hair. "With Diego, I just kind of wipe him off," she said. I found that hilarious for some reason, picturing her with a damp sponge...counters, table, and oh, yes, let me take a swipe at the dog. If you need a nice meditative dog fix, go see what the Shiba Inu puppies are doing on the puppy cam. Let's all say it together: "Awwwwww." There is a simple way to discover under-appreciated blogs and help them reach the audience they deserve. In fact, with no special effort and in one fell swoop, you can now find these sites and reward the creator in a powerful way. There are a ton of brilliant blogs that are being read by almost no one. Some authors give up for lack of readers. Others continue to produce clever, insightful pieces that remain hopelessly buried and forever unappreciated. If the blogs with the best content always rose to the top, readers wouldn’t have any trouble finding them. But that doesn’t happen, so instead, it takes either luck or a lot of work to discover good new blogs. This is a problem we can do something about without too much trouble. Here’s what I’m thinking. 1. Gather some nice bloggers who believe in helping good content rise. The more the merrier. This becomes our group for the project. 2. A good, lesser-known blog is chosen. Everyone in the group will read that blog for two weeks. 3. At the end of the two weeks, the group moves to another blog to read. With scores of bloggers focused on a particular blog, the author should see many nice things happen over those two weeks, especially if the blog really is a hidden gem. This includes discussions, traffic, constructive criticism, encouragement, and connecting to some of the bloggers in the group. That author then joins the group and we move along and do it again. Picture what success might look like. What if we get hundreds of bloggers playing along? What if bloggers like Seth or Dooce or other iconic bloggers join in? Imagine how it would feel to have those numbers and those people looking at your blog after it’s been frustratingly quiet for months. It would be tremendous. That blogger would be permanently bolstered, and it would all be because of the strength of their content, and anything that allows bloggers that focus fully on content to succeed is great for the medium. How well this takes off will hinge on how well I’ve explained the idea and whether you decide to play along. Participating is so easy and the benefit to bloggers and readers could be tremendous–you really can’t lose. 1. Comment on Chuck's Blog to express your interest in participating. 2. Be willing to add only one new blog’s worth of reading to your life. This will be a different blog every two weeks. With so little required and such great possibilities, why not try? Instead of analyzing and getting everything right up front, let’s just take the first few steps and see where that takes us. Again, there’s no risk here. There’s no angle. It’s just a promising idea. I’m not going to load this with links. If the idea is good, help me spread it. That’s the spirit of this whole project anyway. We’ll try to get a bit of momentum gathered while the final details are set up, and then I’ll reach out again. One of my favorite parts of the local newspaper is the kids' page. I know I try to make out like I hate kids. So sue me. They aren't so bad in print. If I could have had book-children instead of physical children, I might have done it. Some of their little stories and letter are so wise. One little girl wrote a short story - I mean a kid short story, not like some Updike thing - about 5 lines. It was about a good little girl and I will never forget the last two lines. "She was a good little girl. She kept everything in order." Wow. What a wise kid. Even at her young age, she knew one of the deepest human desires - to keep everything in order. Or to at least look like we are. That's it, isn't it? We walk around in this world, hoping, praying, that somehow on this day, at this time, we will manage to keep everything in order for ourselves and for our loved ones. So much of what we do is to keep the disorder at bay, to stop the scary thing from happening. And our levels of order are different. Some people feel the world is all wrong if they don't have a 5,000 square foot house on the golf course and a thousand employees, while others settle for much, much less. Today I was walking in the park and there was a guy kind of camped out there. He had his bike and a bunch of stuff, a sleeping bag, and he was just sitting at a picnic table with his back against it, his head on his chest, his arms crossed in front of him, dozing. I wondered about him, how he had ended up there. Some people are so hurt and broken that a small bit of order is all they can put together at one time - to hang onto the bike and sleeping bag, but not a home or job or family. Or maybe that's all the order he wanted. Maybe he felt free there, snoozing in the breeze while I had to rush back to work.